Henri Selmer's Offices, Factory, and Warehouse at Braintree, Essex. The Home of Selmer Amp Production from 1969 onwards. Would you believe that it all started in France before the Franco-Prussian War when, in 1858, Henri Selmer was born. He grew up to become a musician, playing the clarinet in the French Republican Guard and later with the Opera Comique and Lamoureux Orchestras. By 1885, Henri had started a small business manufacturing reeds and mouthpieces for clarinets, and by the turn of the century, this had developed into the production of clarinets themselves. In 1904, Henri's younger brother, Alexandre, who by that time was himself a musician playing with the Boston Philharmonic and Cincinnati Symphonic Orchestras, introduced Henri's new instruments to America, where they were a major success. In order to meet the growing demand, Henri first expanded his first workshop in Paris at the Place Dancourt, and then in 1919 opened a new factory at Mantes, about 30km from Paris. The story now jumps forward in both time and location...... An Englishman called Ben Davis was demobbed from the British Army in 1919, after the First World War, and just when Dixieland and jazz was becoming popular in the UK. Being fascinated by the new sounds, Ben taught himself to play the saxaphone. Over the next few years, he played with most of the big bands in the country, and finally formed his own. Being a man of considerable drive and ambition, Ben Davis could see further potential in the music business. Following a meeting with Henri Selmer in 1928, Ben established the Selmer Company in London, on the 1st floor of 126, Charing Cross Road. Ben's initiative was a success, and the first premises were soon outgrown by 1932, when the business was moved to 114-116, Charing Cross Rd. The company's greatest period of expansion was from 1934 to the start of World War Two in 1939. By the time of the outbreak of war, Selmer was the biggest company in the UK musical instrument industry. After the war, Ben's brother Lew Davis, who was himself a leading trombonist, joined the company, and in 1953 a further move away from the French company occurred when Musical and Plastic Industries was formed as a public company; this being the new holding company for Selmer and an associate company called Selcol which made plastic toys and garden furniture. The gap between the two Selmer companies was widened in 1964, when the Davis brothers sold their majority shareholding to a Midlands company who's core business was the manufacture of umbrellas! This company very quickly got into difficulties, mainly due to the umbrella side of the business, and the bankers took control. They appointed a Mr John Cochrane as Chairman & MD, and it was he who steered the Selmer company very successfully during the next period between 1965 and early 1972. The Davis brothers retired to live in the South of France. 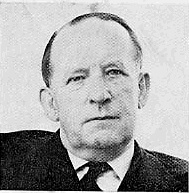 John Cockrane - Chairman & Managing Director 1965 to 1972. In 1972, John Cockrane retired, and it would appear that from then on, problems developed with Selmers. Around 1974, the company was purchased by Chicago Musical Instruments (CMI), as a base in the UK for their own operations - in particular Lowrey Organs. The development of amplification was allowed to dwindle and the Braintree factory was eventually closed. Selmer amps continued to be made for a while after in a much smaller unit on an industrial estate in the same area. Production finally came to a close in the early 1980's. The Woolpack Lane factory at Braintree stood derelict until it was finally demolished in the mid 1990's. A private housing development now exists on the old factory site. The Henri Selmer company in France, continued to specialise in wind instruments, which of course have gained an excellent reputation all over the World. Of more interest to guitar enthusiasts however, was the acoustic guitar designed by Mario Maccaferri, which was manufactured for a short time in the 1930's by the French company. This rare instrument gained fame through its use by Django Reinhart. There are two official Henri Selmer Websites which as well as describing the companies present activities, also provide a much more detailed history of the French Selmer parent company. Click HERE for a link to the US site, and HERE for a link to the French (English translation) site. In the early 30's Selmer were actually the first UK musical company to sell amplification equipment - this being equipment made by the Operadio company, which was imported into England from the United States. However, in 1935 the company commenced producing amplifiers under the Selmer brand name, at Charing Cross Road. This facility was given a boost in December 1947, when Selmer purchased RSA; a company that had been producing a range of PA amplifiers since 1946 under the RSA and Truvoice names. It was therefore easy to expand the RSA production into guitar amplification in the mid 1950's with the introduction of models like the early RSA (non-Selmer) Truvoice Model TV15. The TV15 (Stadium) and TV6 (Popular) and similar model designations on early Selmer Truvoice amps was a throwback from that era. (This numbering system was used on the majority of Selmer amps until the mid-60's.) Selmer/RSA amplifier manufacture was carried out at a factory in Theobalds Road, Holborn, London by that time, releasing the Charing Cross Road building for retail purposes and offices. Warehousing facilities for the vast range of instruments which Selmer were now dealing, was a Clerkenwell. In parallel with the amplification manufacture, Organ production began in 1951 at the Theobald Road factory. One particularly successful model was the Clavioline, a French designed and licensed multi voice keyboard which was intended as an accessory to a piano. Over 15,000 of these instruments were finally made by Selmer UK. Restrictions on American imports into the UK were lifted in 1955, and Selmer then obtained the franchise to assemble Lowrey organs at Theobalds Road. Cases for organs and Leslie speakers were made in UK by specialist contractors. The electronics of the organ and all the other parts, including speakers, were imported from the Lowrey company in Chicago. In addition to their involvement with Lowrey Organs, Selmer of course distributed a comprehensive range of Hofner guitars from between 1952 through to the early 1970's. (Selmer were the exclusive distributers of Hofners in the UK from 1958 through to the late 1960's.) As well as throughout the UK, Selmer supplied Hofners to just about all corners of the old British Empire, including Australia, New Zealand, and Canada. In addition, Selmers were the main agent in the UK for Fender guitars and amplifiers, in between the Fender distributorships of Jennings Musical Instruments (Vox) and Ivor Arbiter during the mid-late 1960s. Many a Fender L-Series Strat was delivered to its lucky first owner in a grey Selmer crock-skin hardcase. These cases, which were also supplied with some Hofner guitars, are now becoming collectable in their own right. Selmer also distributed Gibson guitars in the UK during the 1960's. During the period November 1968 to February 1969, all manufacturing and distribution was moved to be under one roof at the old Selcol factory at Woolpack Lane, Braintree; i.e. the Sales Office was moved from Charing Cross Road, the Warehousing facilities from Clerkenwell Road, and the production plant from Theobalds Road. From then on, two production lines existed at Braintree; one for Lowrey Organ assembly, and the other for the Selmer amplifier production. Only the retail outlet was left at Charing Cross Road - Selmer Musical Instruments Ltd. In addition a highly effective (by the standards of the day!) Quality Control and Service Division was also set up at Braintree. An article in an Industrial Profile dated May 1970 states that "two men work full time on guitar repairs. All but the cheapest of guitars are given a thorough check before despatch to dealer." Glorious days indeed!! 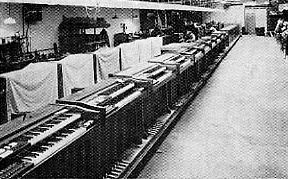 The Lowrey Organ assembly line at Braintree. 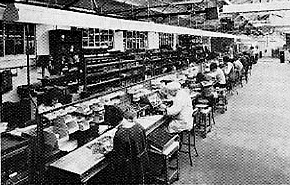 The Selmer Amplification assembly line at Braintree. Allans memories of Selmer Amplifier manufacture in the 1960's. Designing and manufacturing Selmer amps between 1964 and 1973. The lighter side of life in the Selmer factory, featuring Ronnie Lane. Tony worked his way up from the wiring bench to become a test engineer. The glamorous world of Selmer's main London Showroom at the peak of its fame. Selmer's smaller retail outlet in London. More stories about life at the Selmer factory in the mid-1960's. Keeping the Lowrey side of Braintree factory running smoothly. The last years of the UK Selmer Company.